Change readiness is the precursor to successful change management. Find out how to know if you are ready for change. Is your company and organization ready for the next big change? 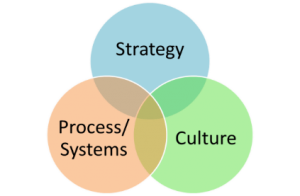 Study after study show that 70% to 80% of all Corporate changes fail AND 80% of the failure can be blamed on not having an adequate Change Management Plan. Yet most leaders when asked how to prepare for the next change, they will focus on product initiatives, customer penetration or technology enhancements. Change Management by definition is reactive, after the fact and while helpful, the proverbial horse has already left the building (to mix metaphors). Change Readiness is all about being in front of change: being prepared for change. Change Ready companies demonstrate the ability to continuously initiate change on their own which keeps them ahead of the `typical external sources for change. Bruce Dougan is the head of Group50’s Organization Design and Development Practice. Bruce and the Group50 team are all former executives with well-known manufacturing and distribution companies who understand what it takes to design, train, develop and motivate organizations to successfully implement a company’s strategic plan. Group50 has designed a series of strategic assessments, workshops and strategic execution tools that eliminate the existence of Anti-Strategy. You can reach us at (909) 949-9083 or send a note to info@group50.com. I really see the value of your Change Management Assessment! From my own experience, I can definitely relate to the “reactionary” mode that so many companies and departments fall into! It’s a tough one to get employees and leaders to change to a “strategic mode” by planning!!! I am impressed that you included Diversity & Inclusion in your Change Assessment toolbox! Much appreciate your insight!